This week I'm obsessed with... Olay Deeply Clean Pore Mineral Cleanser! 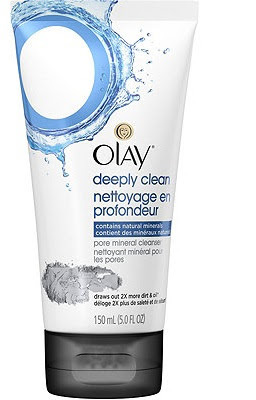 Olay Deeply Clean Pore Mineral Cleanser - 150ml - $8.99 - a daily cleanser specially designed for oily/combination skin types that lathers, refreshes and cleanses without over-drying skin thanks to a natural kaolin clay formula that controls shine and reduces the appearance of pores in just one use. With an oil-free, non-comedogenic formula that is infused with a mineral complex, it has the purifying power of a mask to draw out impurities like a magnet for a deep, down-to-the-pores clean that leaves skin feeling refreshed and looking healthy and brighter.